WIMM Wearable Platform: Microsoft SPOT Redux? As technology advances, the trend is to go small. That's what Silicon Valley-based WIMM Labs has done, debuting on Tuesday its modular Android concept, called the WIMM Wearable Platform. This one-inch square device has Wi-Fi and Bluetooth connectivity and supports up to 32GB of memory. A capacitive touchscreen graces a "bi-modal display." What that means is this: when not in use, the WIMM device will employ a standard reflective display mode, similar to a standard digital watch. 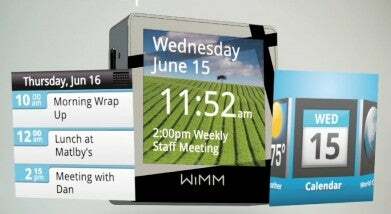 Then, when needed, the WIMM device can switch to a color display--this bi-modal display helps conserve battery power. WIMM has chosen Android as its platform in hopes that developers will be more inclined to write applications for the device. Writing apps for the WIMM device will be no different from writing apps for a phone--though, of course, developers will want to take the device's 160 by 160 pixel screen into consideration. WIMM also wants apps to be simple, which should make development easier. Such "mini-apps" will concentrate on small, bite-sized portions of news--such as the weather, or headlines. WIMM has also developed an app that allows users to make mobile payments at Starbucks, so the possibilities seem pretty endless. While apps can be content-rich, developers will need to keep in mind that the WIMM device must be paired with a Blackberry or an Android phone to access a data (3G or 4G) network. The device does, however, have built-in GPS. As cool as the new WIMM device may sound, it's nothing new. Microsoft was hawking a similar technology to its partners in the form of SPOT, back in 2003. However, SPOT used data that piggybacked on FM radio signals, in order to operate. While it was undoubtedly a nifty technology, SPOT never gained much traction in the marketplace. Issues with bringing the technology to the market, as well as a lack of coverage, seemed to kill SPOT. The service itself began winding down in 2010, and will be turned off at the end of this year. WIMM may not have to deal with these issues due to strategic differences, but I have a feeling it will be as unsuccessful. At the time of SPOT, smartphones were still in their formative stages, and so the technology made a little more sense. Today things are much different. Smartphones are commonplace, complete with richer app experiences than a device like this could ever provide. Also, think about how many people wear (or need) a watch anymore. All this makes WIMM seem like a fairly useless concept to me. I'd rather spend the money on a full-featured smartphone! I guess the question now becomes, "What's the point?" WIMM is going to have to answer that.